One of the things I love (and sometimes hate, depending on the day) about how my son’s food allergies have changed our lives is that all meals have to be a priority. There are times when I love that, and others where I stamp my feet and pout (it’s not pretty) in hopes that my husband will say those magic words…”Honey, I’ll cook tonight”. 🙂 It doesn’t always work, but when it does, I am one happy girl! This is one of those meals that taste delicious and take very little effort to make. Love that! 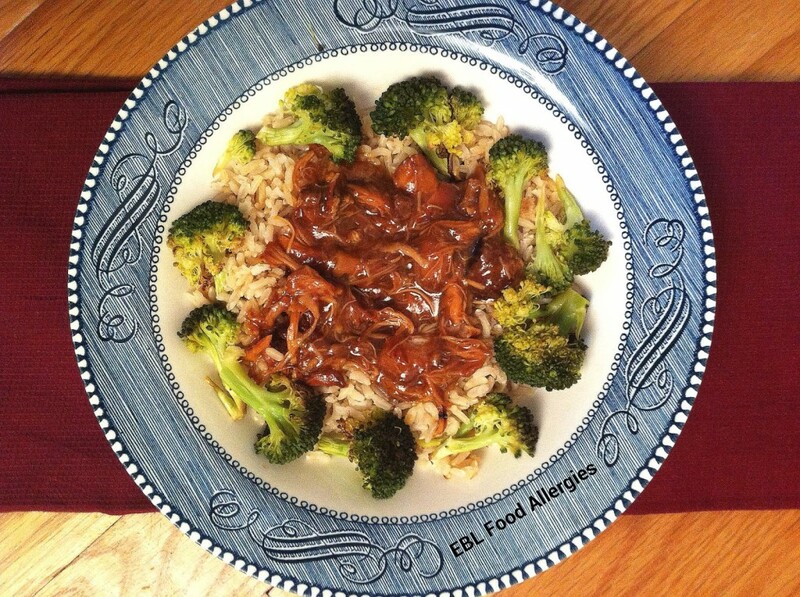 The picture above happens to be the leftover slow-cooker chicken which I made for lunch the next day with brown rice and roasted broccoli also leftover from a previous meal. The night I made this meal for dinner, I served it over vegetable quinoa which I had made earlier in the week. Big time saver and perfect for nights when the kids have sports or we have a lot going on in the evening. Line the slow-cooker with a cooking bag or bag specific for slow-cookers. Add chicken to the cooker. Mix the cranberry sauce, jelly, honey and cornstarch in a blender on low and pour over chicken. Add the onions on top. Twist and close the liner bag (this prevents moisture from escaping and creates moist meals) and cover. 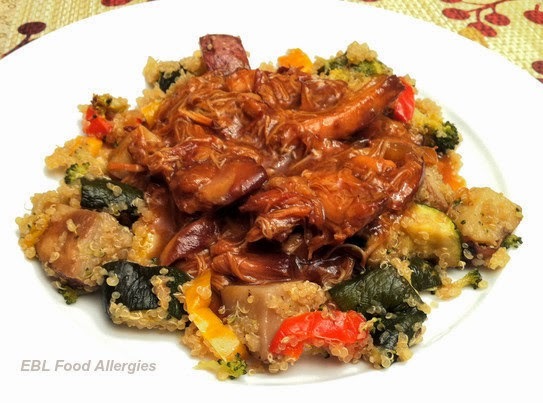 Cook on low for up to 8 hours or high for 4, server over brown rice or quinoa. This recipe is brilliant! I make something similar and I know this would be delicious. I never thought to use fresh chicken thighs, perfect! This sounds really good! 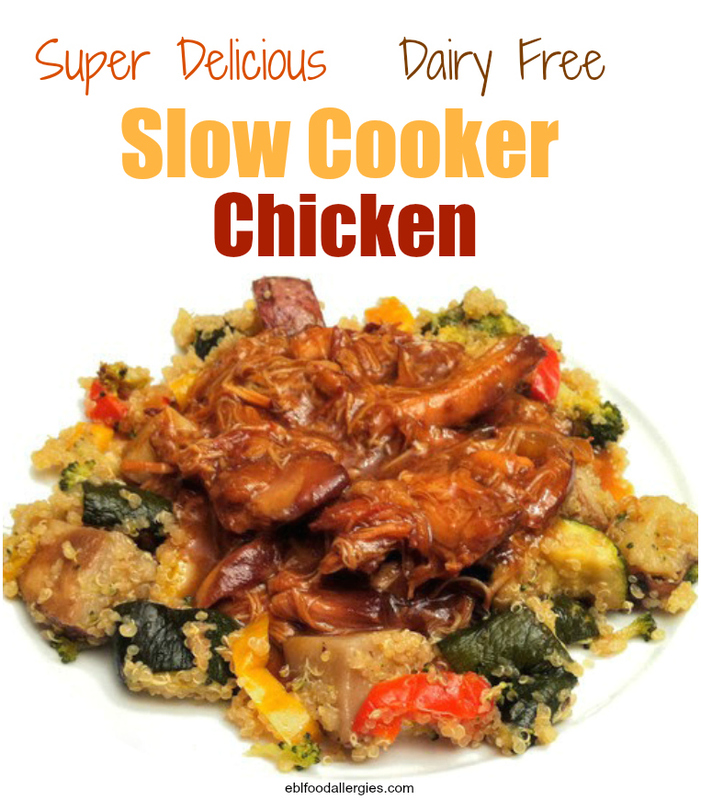 I love an easy slow cooker meal.